I hate them both. With a passion. Not because I am some hyper environmentalist nor am I on a green movement to stop the destruction of our planet’s forestation. No, I hate them because of what they represent to me. They are the very image of surgical and treatment centers. This upcoming Saturday, September 5th will be my wife’s 2 year cancerfreeversary. Yes – we made up a term for it and yes – we celebrate it. Over the course of the last 2.5 years, I have spent a lot of time in the waiting rooms of medical centers. What the medical team won’t tell you when a loved one is diagnosed with any disease that involves long term care is the amount of exposure you are going to receive to Styrofoam cups and old magazines. They won’t tell you that you are going to spend days in waiting rooms. Waiting for diagnoses. Waiting for consultations. Waiting for treatments to complete. Waiting for recovery. Waiting where the only refreshment is either coffee or water – served in Styrofoam cups. Waiting in rooms where there are old magazines everywhere. For the loved one of someone going through something like cancer, you will wait a lot and it is the hardest part!!! Yes, you will be a shoulder to cry on. You will be a punching bag to work out aggressions. You will be the encourager when they think they can’t keep going. You will be a nursemaid as they recover from chemo/radiation/surgery. You will be all of those things at once but in all of those times, you are doing something. You can take action. Once they go back with the medical professionals, you are left to just wait and pray. Wait with a Styrofoam cup full of coffee and an old magazine to distract you. I hate Styrofoam cups and old magazines. But back to something more positive – celebrating the gift that is the cancerfreeversary. This year we are celebrating by having what we hope to be the final procedure in her reconstruction journey. In fact, they just rolled her back to administer the anesthesia and begin the procedure. 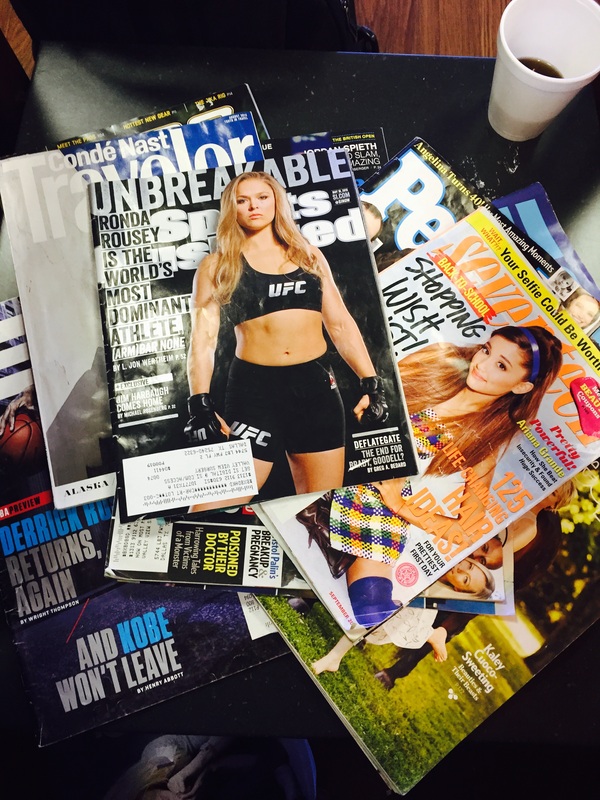 So I am sitting in yet another waiting room, with my cup of luke warm coffee in a Styrofoam Cup leafing through old magazines deciding between an issue of Seventeen from 2014 or Sports Illustrated from 4 months ago (at least it is featuring Ronda Rousey but with my passion for all things MMA, I guarantee there is nothing new in there for me). I hate Styrofoam cups and old magazines but I am so thankful for another opportunity to be here. I am so thankful for the wonderful health care professionals who provide them and for their dedication to both their patients and their family. I know it is hard to imagine but I literally almost died because of my fitness – not because I was morbidly obese or a couch potato but because I was too fit for one part of my body’s own good. It’s true and 3 years ago my body showed me exactly how much I could take before it gave out, literally. To tell the story adequately, we need to jump in the time machine and head all the way back to 2009. I was an overweight dad who had decided to take up karate with my kids. Now if you know me at all, I am not big on doing things half way. I am either going to do it or not. There is very little room for ‘in between’ in my psyche. I was going to earn my Black Belt in American Karate, period. I am sure if I am being honest my desire was in no small way spurred on by the fact that my eldest son was in training for his Junior Black Belt at the time and there was no way I was letting him earn it without me being on his heels. After one particularly ‘hard’ session back when I was an intermediate belt, I found myself completely drained and every joint from my lower back down was in pain. It was then that I took a long hard look in the mirror – they are everywhere in our Dojo – and realized that I had become only a reflection of the physical man I used to be. 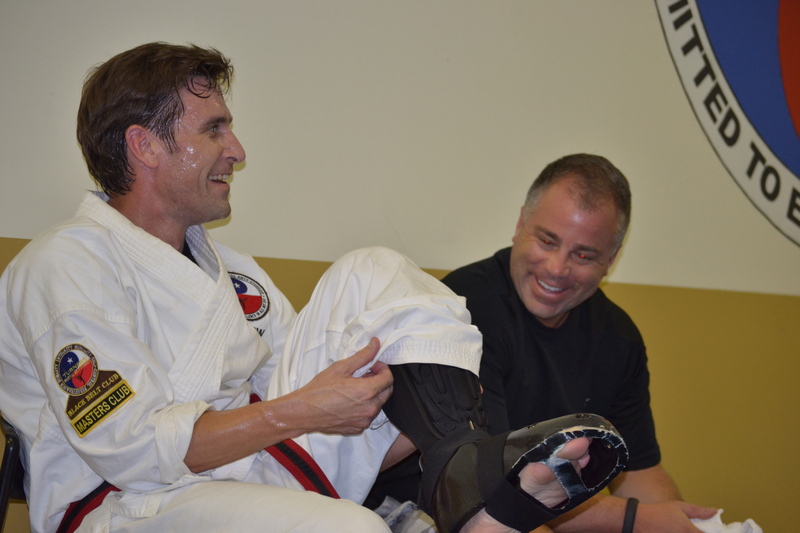 To top it off, I was watching my son train harder than he ever had as he prepared for his black belt test and was quickly coming to realize, there was no way I was going to make it through a Black Belt test if I stayed in the shape I was….and that shape was soft and round. I knew I had to make some major changes if I was going to ‘survive’ my black belt test and I was determined to do so. Cue the Rocky Theme music now!! I set myself on a path to not let my traveling lifestyle be an excuse for being out of shape. I started watching what I ate for the first time ever (God I miss Fish & Chips). I became disciplined about working out. I incorporated weightlifting, running, HIIT cardio and kickboxing all back into my routine. Eventually the weight started to come off and I started to feel good again. When all was said and done, I dropped about 30 lbs. Three years later I felt good, I felt strong, I felt ready. I felt like I was ready for the next big hurdle, my black belt test. In order for you to get a feel for what I was facing, let me describe to you the way a Black Belt test works. It is a two day affair where Day One is the ‘easy’ day physically. You are required to do all of your Katas (think choreographed shadow boxing fights) at least 3 times, including at least one Black Belt level kata. Along with that you have to break 5 boards in under 2 minutes using a variety of techniques and finish it all off with a verbal presentation on why you are deserving of the rank of Black Belt. No problem. Easy peasy – we got this day. Day two is ‘slightly more intense’ to put it mildly. It was by far the hardest day of my life physically. It starts with self-defense techniques of your own design. Now these are not demonstrations, they are self-defenses. It is the closest you will ever come to being attacked without actually being attacked. You job is to prove the techniques work in most dire of circumstances….and it is your attackers job to simulate the most dire of circumstances. Once those are done, you do them again….over and over and over again. Follow that up by a ‘quick round’ of grappling (mine lasted nearly 5 minutes) and then we get to the actual sparring portion of the test, fifteen 2-minute rounds with a black belt or black belt candidate with 30-seconds of rest between rounds. Oh yeah, and if your round is not considered to be at a Black Belt level, you get another until you have amassed 15 Black Belt level rounds. But wait!! There’s more!! Not only are you sparring a fresh opponent every round, but at the end you get to do multiples (meaning you are sparring more than one opponent at the same time)!! Now do you know why they don’t let Beginner and Intermediate Belt ranks watch Black Belt tests!?!? So on a hot July night in 2012 I bowed on the mat for the second half of my test and everyone was in a jovial mood. I think we all thought it was more of a formality than a physical test at this point. If you have done the work to that point, you have already earned the belt, you just needed to show it and I was prepared to do so. Up first were the self-defenses. I picked my attacker (where this sadistic tradition came from I do not know) and of course picked the biggest guy in the room. Go big or go home. Bring on the 6’ 4” – 230 lbs-er!! The first attack was a Rear Bear Grab from behind (think big hug from behind that traps your arms by your sides). My body moved just like it should, muscle memory kicking in and taking over for the brain, I escaped and countered in a flash. I helped my attacker back up from the ground, fixed my Gi and then I felt it. Something was not right and I knew it immediately. My heart was racing and I could not bring it back down. “That was normal right?” After all, adrenaline had just flushed through my system as a 6’ 4” – 230 lbs man had just attacked me from behind and was continuing to do so from all kinds of angles with all kinds of weapons. “It’s normal to have your heart racing. It’s what your body needs. Blood to activate muscles. This is normal.” – the mantra kept running through my head. After about 20 minutes of continuous attacks, it was time for grappling. Evidently since this is one of my passions, they decided to add it to my test….all I had to do was to get out of one person’s guard and submit him. However the ‘one person’ was the one person in the dojo that was the most superior grappler. Easy enough. The key to grappling is to relax and slow things down so when you need to explode, you can. For the entire 5 minute session, I was trying to concentrate on bringing my heart rate down and just couldn’t do it. I finally submit “Thor” – (seriously, when The Avengers came out he did an appearance at the Dallas premier as the Norse God) and get a reprieve long enough to gear up for sparring. Now I don’t tell anyone but I know I am off my game and even used the restroom as an excuse to buy an extra 3-minutes to get it back together. Below is a picture of me and my “corner man” in the break. Nothing is wrong is it? Heck, I am even smiling knowing what is about to come. It is finally the time we have all been waiting for, the sparring section of the test, the part where everyone fades and struggles. The part I was determined to shine through and not fall off like so many have before me. I think my wife described it best. I started off sparring at about a 7 out of 10 for me. I did not have a lot of the flash I normally did but I was effective. By round 7 I had degraded to a 5 out of 10. By round 10 I was about a 3 out of 10 and by round 15 I was “drunk boxing”. In fact, in my last round my sparring partner (same guy who was attacking me earlier ironically) did not punch or kick me once and I still fell down 3 times. I was literally dying at that point and did not know it. After that round, things got real bad, real fast. This is where my body started to give out. I had been training hard for this so it was used to being abused so it took a long time to break. I would routinely push my heart rate to the 180 – 200 BPM range in order to train anaerobically. It was ready for a lot but it was not ready for what I had just done. After my sixteenth round, I passed out on the mat. Immediately the group knew something was wrong and 911 was called. I was taken to the local hospital where for a short time I came to and was responsive but not quite entirely there. The cognitive tests they were conducting were not going like they would hope and then it happened. My body literally shut down in just about every way you could imagine. To top it off, my eldest son was there witnessing the whole thing. I was in trouble and thank God the medical professionals who were present brought me back. If you want to find an upside, at least my wife and I got to experience what it is like to fly in LifeFlite Helicopter. She will have to tell you about that experience because I do not remember it (I do have the picture to remind me though – so there’s that). When we got to hospital #2, they immediately were concerned about aneurisms and/or stroke. After all, I had just been repeatedly kicked in the head by some top level black belts and was slurring all of my words before I lost consciousness. 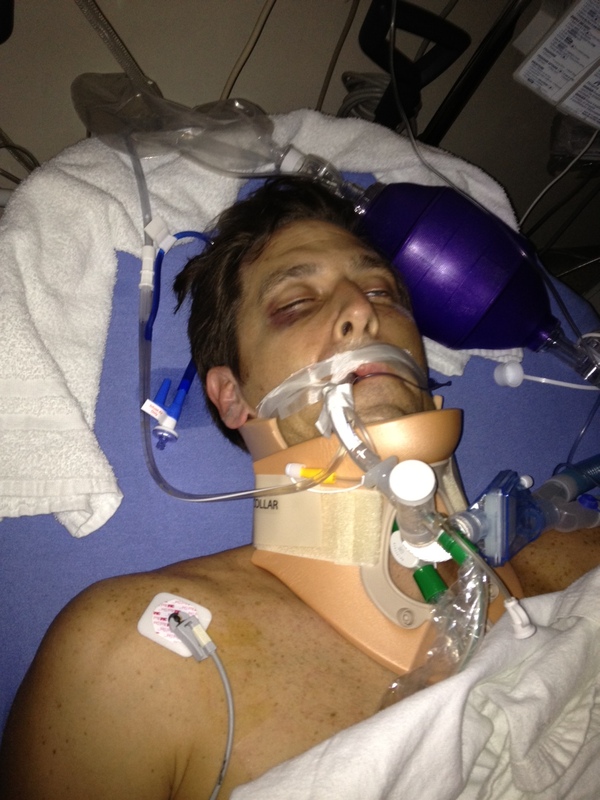 Because of that, they decided to keep me in a medically induced coma and on a ventilator until they could learn more. I spent 36 hours that way and my corner man snapped the picture below to document the process. I was dying and because there was not an obvious cause (like obesity, heart disease, etc. ), the doctors were struggling to come up with a diagnosis. After nearly 2-days of doctors, neurologists, internists and other specialists, they had determined only that I did not have an aneurism. Fortunately, that was enough to bring me out of the coma and pull the tube (Dear God that sucked). This is also when friends stopped planning on how to support Joy once I was gone. I only wish I was kidding about that last statement. At this point, the medical focus turned from my brain to my heart. I was blessed to have an amazing medical team including the head of cardiology at Baylor Medical Center on my team. Eventually they identified the issue as Atrial Flutter. Now granted, it took 3 days and at least 5 doctors to get to this diagnosis but at least we got there. It all stemmed back to the first attack in my self-defenses and the elevated heart rate. My heart stopped beating like it should and never actually allowed for the lungs to oxygenate my blood. I basically suffocated myself through excursion. Think about that for a second….because I was fit, my body could handle the lack of oxygen in the short term but not for the 90 minutes plus I put it through. And because I was fit, my medical team had a hard time identifying why I was there to begin with. Because I was fit, I nearly died and the medical profession had no clue why. It is easy to diagnose someone who is obviously morbidly obese – someone who is physically capable, not so much. Fortunately for me, they were able to surgically repair the defect and I no longer have any restrictions on training. However the fact that my fitness got in the way of a diagnosis has never left me. I cannot tell you how many times Doctors and Nurses commented on the fact that they do not get many “healthy” people in the ICU unless it is a function of acute trauma. The fact that I could take punishment and push my body to the brink got me through that mess but the fact that it also confused the heck out of my medical staff was incredibly frustrating. More relevantly, I travel for a living and train for fun. I was routinely getting my heart rate up above 200 bpm in hotel gyms, conference rooms, lobbies and anywhere else I could manage a training session while I traveled. Being fit meant I could make it through short term sessions (truth being told, I had felt the experience of an elevated heart rate before and had stopped my workouts before any serious damage was done. Not very often but it had happened). God blessed me by keeping me safe in those remote training sessions and putting the right people around me when I did crash out. My fitness allowed me to push through the pain. Push through the shortness of breath. Push through the brink of death. I am quite sure it ultimately saved my life.